This study was conducted to find out Turkish foreign policy towards Syria influenced by the cognitive aspects of Erdogan. This study aims to analyze how the philosophical beliefs and instrumental beliefs that Erdogan has associated with Turkey's foreign policy towards Syria in solving the Kurdish separatist problem. This study uses an operational code approach, where there are two types of beliefs that can influence individual decision making, namely philosophical beliefs and instrumental beliefs. The operational code was used to review how Erdogan's confidence affected Turkey's foreign policy towards Syria. This study also uses qualitative research by examining the consistency between operational code and the content of the policy it takes. The findings of this study show that Erdogan's various philosophical and instrumental beliefs influence foreign policy. ISLAM, Umar Muizzul; PURNAMA, Chandra. Kode Operasional Erdogan Berkaitan dengan Kebijakan Luar Negeri Turki terhadap Suriah. TRANSBORDERS: International Relations Journal, [S.l. ], v. 2, n. 1, p. 13-25, dec. 2018. ISSN 2598-9200. 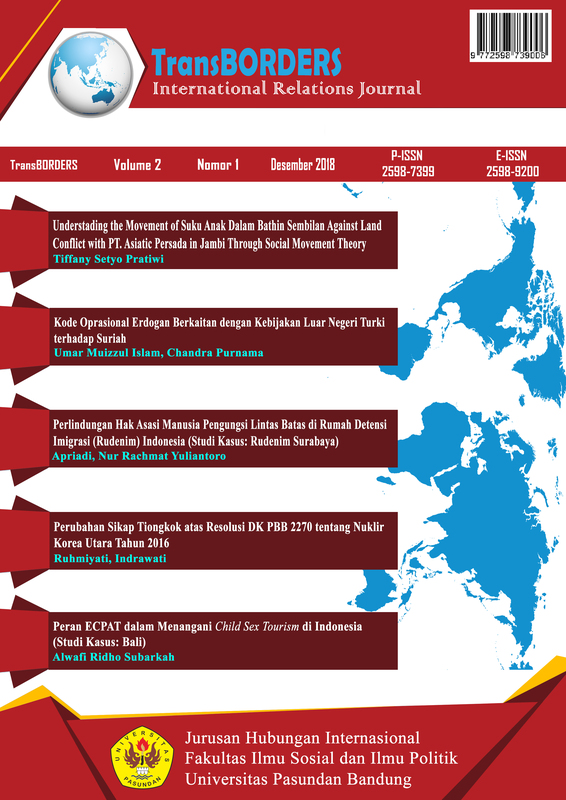 Available at: <http://journal.unpas.ac.id/index.php/transborders/article/view/968>. Date accessed: 18 apr. 2019. doi: http://dx.doi.org/10.23969/transborders.v2i1.968.